In Labora I found a place of great inspiration and extraordinary people. They taught me a lot about printing techniques and gave me the opportunity to develop my personal work. Initially, I did not have a clear idea about what artwork to create. I started off by researching Estonian mythology with the intention of illustrating Estonian myths and legends. I came across the legend of Kalevipoeg, the main character of the Estonian national epic. I soon understood that it was not the right path to take, as illustrating this epic could become too serious and boring. I started thinking about something more dynamic and suitable for my situation – so the idea of a sketchbook was born. I made the drawings in my sketchbook with the intention of printing them later on. I therefore chose to draw in a cartoonish style and with a black pen on white paper. That way a photopolymer printing plate could be developed from the illustrations without much editing needed. Nestor’s illustrations provided much inspiration when it came to developing my own work. 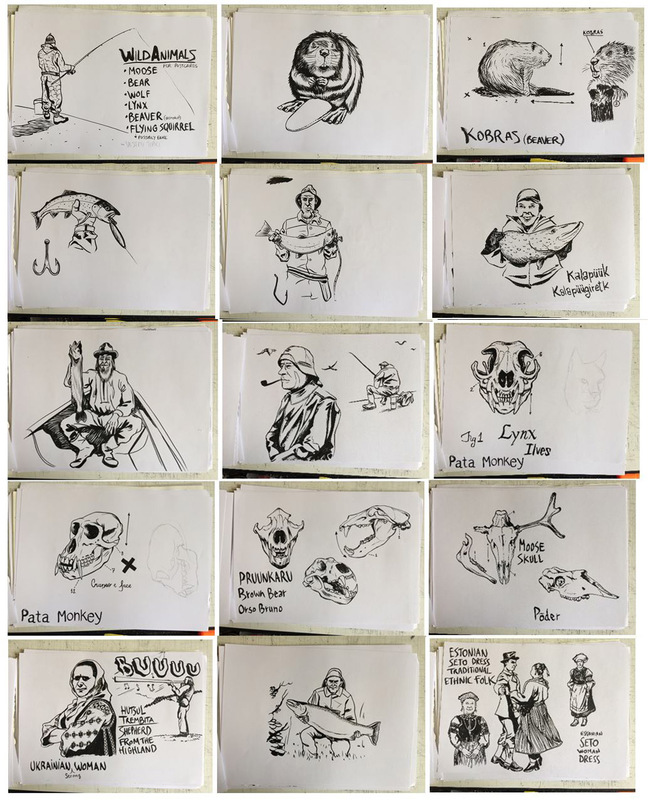 The sketchbook covers a variety of themes, their uniting topic being Estonia: Estonian folk culture, traditions, and animal species such as fish, bears and beavers. The aesthetics I aimed for were those of old anatomical animal drawings. 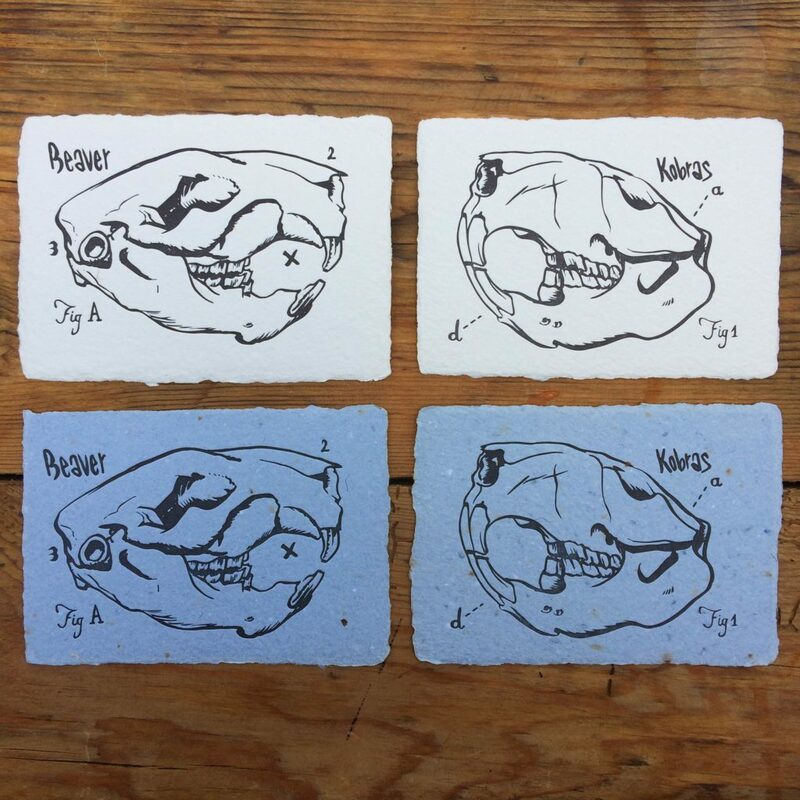 The ones depicting animal skulls and other body parts from various angles, with graphic elements which give harmony to the composition as a whole. 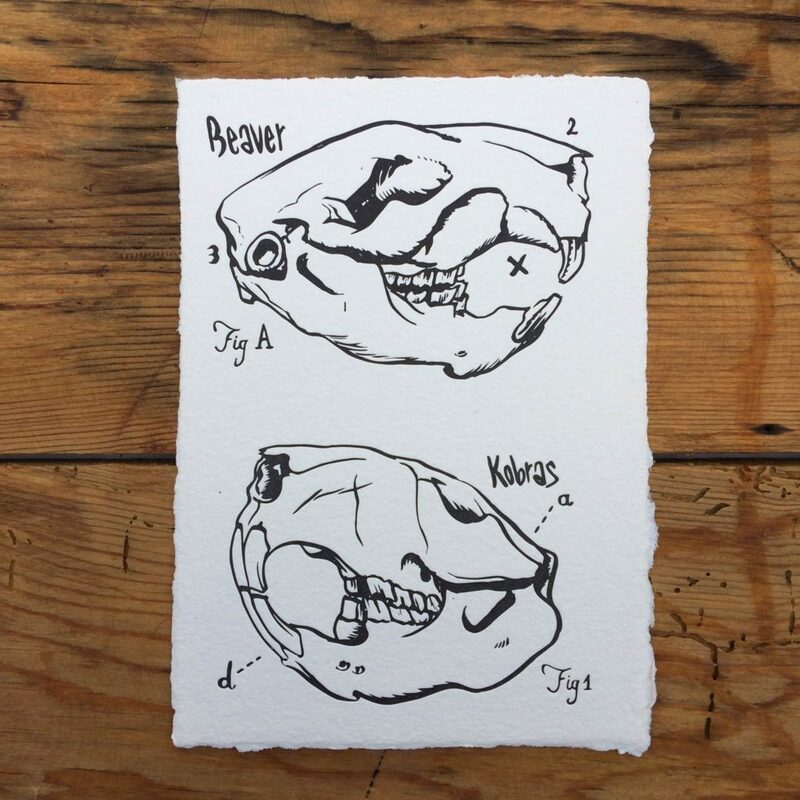 My final work ­­‑ the illustration I chose to print with letterpress – depicts a beaver skull. When it came to choosing the format, I wanted to play with the composition; two skulls which would fit perfectly onto an A5 and at the same time could stand alone when printed onto an A6 format. Once I decided on the format, I could go down to Labora’s paper workshop and make paper by hand under Veronika’s guidance. Casting paper by hand is a long and tiring process, but at the same time very satisfying, especially once the final product is done. The texture of Labora’s handmade paper is unique and its structure and thickness complements leterpress wonderfully. Once the sheets of paper were dried, I could print on them. First, I processed the photopolymer printing plate with my design. Hannah, Labora’s printmaker, explained the proccess and took me through the complex procedure step by step. That way it wasn’t hard to understand what I was doing. 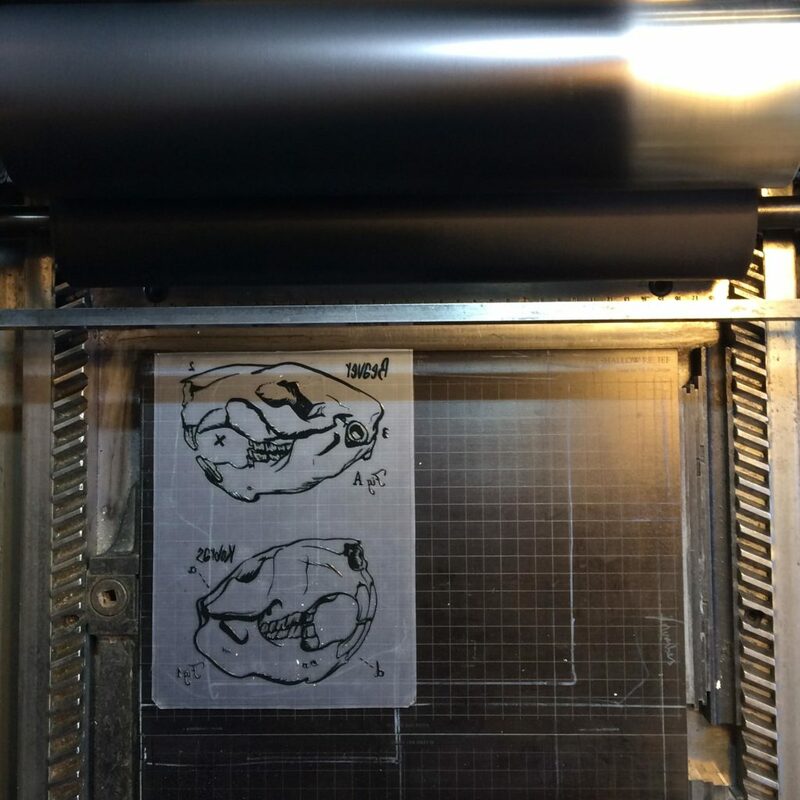 The printing plate is made of photopolymer, a substance sensitive to light. 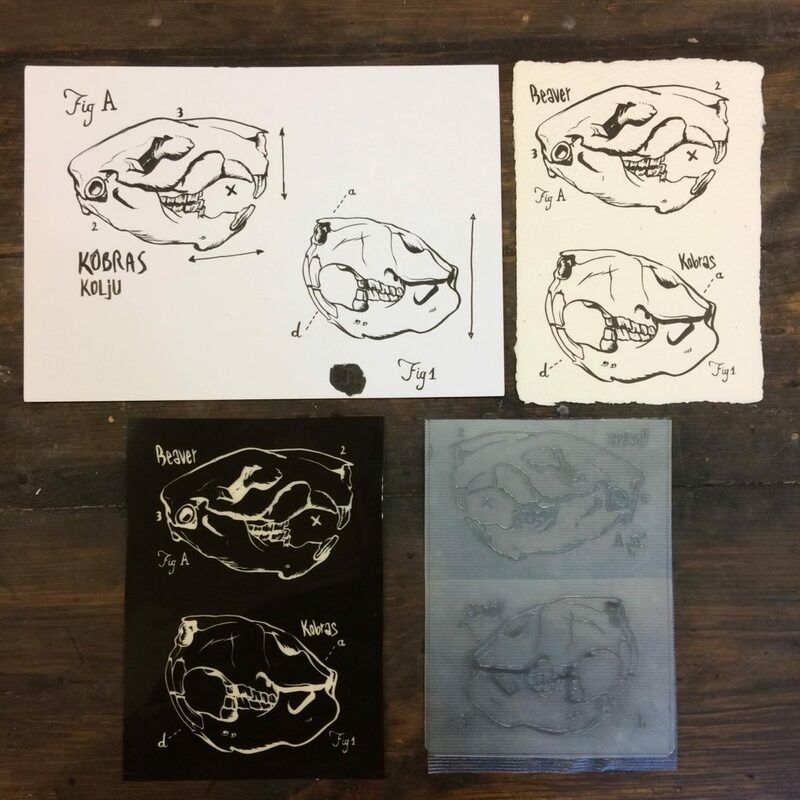 You place the separation (that is the design printed in negative on a foil) onto the printing plate and blast it with UV lights. The light that shines through the separation hardens the photopolymer, creating a printing plate. The next step was printing onto handmade paper. I chose black ink, so that the prints would look as similar as possible to the original drawing. I printed a series of 50 A5 prints and 25 A6 prints. Text and photos by Matteo Capriotti. You can see his work here.